The following women who make up the HOPE+ house each have their own difficult story of survival, much of which is too long to do justice here. You can search for us on Facebook, look for the Friends of HOPE+ Africa group wall, also you can subscribe to our emailed newsletter. If you pass the “How do we know you?” test question we will add you to our mailing list so you can follow along with everyone’s growth. 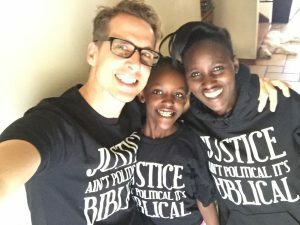 Paul and Hope Phillips started HOPE+ Africa in 2010, shortly after Hope and Paul met and fell in love, Hope and Jojo’s story of survival inspired Hope and Paul to become agents of grace to poor women, particularly those suffering from HIV and AIDS. Read more of Hope’s story. 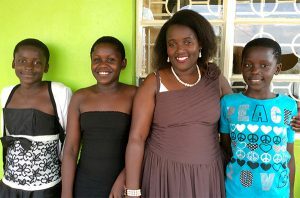 Barbara, Nyangoma, Nyakato, and Faith have been with us since the founding of the HOPE+ Africa house in Uganda. Barbara is Hope’s little sister and she suffered much of the same crushing poverty that Hope did as a child. Barbara dropped out of school and married young with the hope of having regular meals. Three kids later her husband, who had three other wives, left them all in crushing poverty again. HOPE+ Africa has provided Barbara and her girls a stable life so they can focus on learning how to be a healthy and whole family. 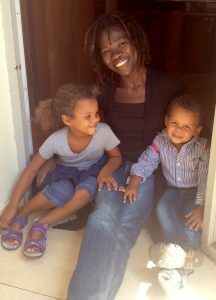 Barbara is an essential part of the HOPE+ Africa house providing pastoral care to all our ladies and kids. Barbara loves to read and study scripture and has a remarkable ability to recall exactly chapter and verse what she has read. Florence, Angel, Elijah, Shalom, and Deborah came to us in 2015, though Hope and Barbara have known her most of their lives. Florence grew up without an education and began work as a “house girl,” domestic servant when she was just entering puberty. She was sexually abused by her employer, made pregnant, then her child was taken from her and she was fired. She has never been able to spend time with her daughter, Shiela, except on her birthday. In Uganda, children are the property of the man who produces them. 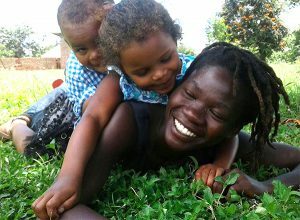 Ugandan women traditionally have few rights and only get their children if the father abandons them. Florence then met a man and they had four kids together, but he abandoned her and the kids. We took Florence in when it was clear she was doing everything she could to care for herself and kids, but was about to become homeless. 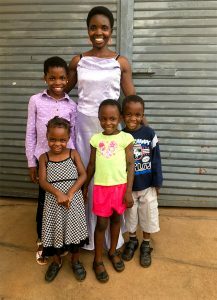 Since she became a part of the HOPE+ house she has impressed us with her dedication to her children and work ethic. Florence is tiny, but all muscle, and she will gladly take on any task. Her kids are all doing great now that they have consistent schooling and a stable home. 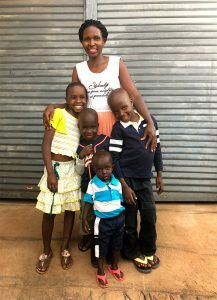 We are seeing Florence develop a deeper and healthier faith in Christ as she processes through the years she spent under the influence of bad theology peddled by prosperity gospel teachers in Uganda and the witchcraft practiced by her family of origin. Topista, Jafar, Fatuma, Alafat, and Rajabu came to us in 2014. Topista was a poor teenaged girl who had rarely been able to attend school when her aunt sold her to a Muslim man who already had two wives. Topista agreed to steal food from the man to feed her aunt and family, but the man turned out to be a loving husband who wanted to care for Topista’s family as well as Topista. Topista grew to love him when she saw he even brought her brothers to live with them to ensure they could eat. Unfortunately, when Topista was pregnant with her fourth child her husband, who worked as a motorcycle taxi man, was killed in an accident. Her youngest, Rajabu, was born with a serious heart defect, and life became exceedingly difficult. A poor church Barbara was visiting adopted Topista and she became a Christian because of their kindness. But they were so poor they could barely care for themselves, so everyone was quite happy when we started assisting Topista. Recently, Topista was the victim of a horrific sexual assault and became pregnant. Barbara has been ministering to her and we are helping with all her additional challenges making sure that she, her baby, and older kids get plenty of food and can stay in school. 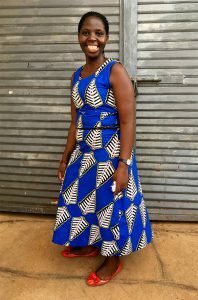 Topista continues to run a small tailoring business she started with our help and training. Dada and Joshua came to Hope in 2009, she has a crushing story of survival of horrific violence as a child that left her an orphan. Her story is very long and heart breaking. Dada stayed with us at the HOPE+ house for several years, then recently moved out to start her own business. She runs a small shop and tailoring business. 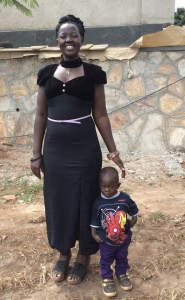 Recently, a homeless mother of seven children abandoned her youngest child with Dada. Dada has adopted the boy, changed his name from Job to Joshua “because Job suffered too much,” she said. She is enjoying being a mother after years of being a much loved auntie to all the kids in our house. Jackie came to us in 2013. She had a very difficult childhood, no school, and survived horrific violence that left her an orphan. She moved out of the HOPE+ Africa house in 2017. She works and lives at a local restaurant. She still calls the HOPE+ house home and comes for Christmas and other holidays. She still depends on us when problems and life get difficult, but we are so happy to see her doing well and growing up to be a responsible young woman. Jaja, Noella, Tadeo came to us a long time ago, it is hard to say when since we have been connected to them since 2009. They have a painful family story of survival of war and poverty. Everyone loves Jaja (means grandmother) because it is an honor to have elders in the house. Noella works daily to keep our house running smoothly with Barbara and she keeps us and our donors informed what is happening at the HOPE+ Africa house. Tadeo joined us recently so we could nurse him back to health after he almost died of a kidney infection. Suzan, Nadia, Levi came to us this year. Suzan is a young professional mother of two. She works with us to ensure HOPE+ Africa runs smoothly in Uganda. Suzan has a full education and gentle nature and understands well our mission since she herself lost her mom when she was a child. She is a tremendous asset and new addition to the HOPE+ family. When you sign up to give monthly to support HOPE+ Africa these are the lives you are investing in, and more beyond the HOPE+ house as our love and work influence our community. You can actually become a part of their story. Someone made an investment in Hope when she was a sponsored child in Compassion International when she was a kid. Her sponsor helped save her from a life where her only option would have been prostitution. We often wonder what the old woman who sponsored Hope would say if she were alive to see what Hope is doing with that investment. This is the ultimate mission of HOPE+ Africa to blend the family of God by sharing each other’s burdens we become a part of something much larger than ourselves. Religion that God our Father accepts as pure and faultless is this: to look afterorphans and widows in their distress and to keep oneself from being polluted by the world. Proudly powered by Jesus-LOVE | Theme: Widows&Orphans by HOPE+Africa.